Rent growth in urban Seattle areas has started to slow, but suburban submarkets are still experiencing impressive growth. The Seattle-Bellevue market continues to grow at an unprecedented pace. The latest employment figures show an annual job growth rate of 3.2 percent; and each year, job growth outpaced projections. This rapid expansion is due in part to the relative affordability of our region when compared to other West Coast cities. Large tech companies continue to relocate and grow in the Pacific Northwest, expanding their office footprint by hundreds of thousands of square feet. The price to live and conduct business is significantly discounted in comparison to the Bay Area. On average, Seattle-Bellevue employees have 31 percent more disposable income than those in the Bay Area, due to lower housing costs and no state income tax. Looking at multifamily, the local market is outperforming its West Coast neighbors and investors continue to see future growth for the region. With the recent influx of new supply, rent growth in urban Seattle areas has started to slow, but suburban submarkets are still experiencing impressive growth. Nearly 12,000 units have been delivered each year since 2015, with 64 percent of new multifamily product delivered to urban markets in 2017. This has led investors to consider deals outside of the urban core. 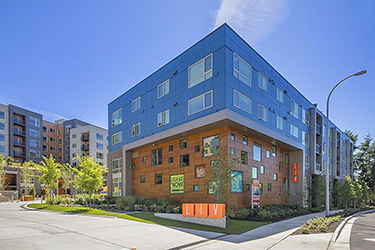 In 2016, JLL led the $172 million transaction for the 451-unit LIV Bel-Red in Bellevue. Bellevue CBD’s biggest office landlord: Vulcan?